A brief statement from Georgiana Myers, a Yurok citizen and spokesperson for the Klamath Justice Coalition, delivered on July 21, 2010, after more than 300 people from 50 Indigenous Nations took control of the Marine Life Protection Act (MLPA) Blue Ribbon Task Force meeting in California. Klamath Media reports. More than 50 tribal nations peacefully took control of the Marine Life Protection Act’s Blue Ribbon Task Force meeting in California Wednesday. Their message: The state will no longer impose its will on indigenous people. The group of more than 300 met up at 11a.m. on the Main Street of Fort Bragg, CA. and hiked up a half mile to the C.V. Star Community Center with a unified voice that pulsed: M-L-P-A Taking Tribal Rights Away! 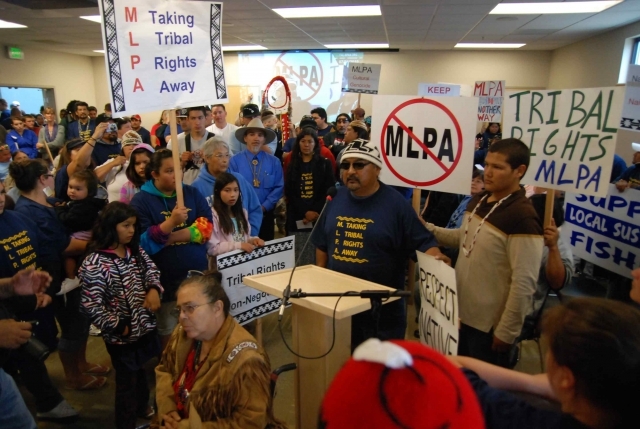 Just before heading into the meeting tribal community members standing twenty deep chanted “No Way M.L.P.A. !” to the Blue Ribbon Task Force Members waiting inside. The Marine Life Protection Act Initiative is a public and privately funded partnership between the State of California and a few deep-pocketed foundations — chiefly the Resources Legacy Fund to — implement the Marine Life Protection Act, which was signed into law in 1999. That Act calls for the creation of marine reserves with varying levels of protection from one end of the state to the other. The Blue Ribbon Task Force is charged with making recommendations to the California Fish and Game Commission of where to put the protected areas. To date, the Task Force has said it will view traditional tribal gathers in the same light as recreational fishermen, which is largely offensive to tribal people. Citizens from tribal nations as far away as the Choktaw Nation attended the meeting to stand in solidarity with the North California Tribes. Many pointed out the absurdity and pain caused by asking Native Americans to give something else. Coastal indigenous people collect mussels, seaweed and other ocean resources for sustenance and ceremonial regalia. All of these resources were abundant until Europeans commercialized them. This is the second time indigenous Californian’s have halted Marine Life Protection Act Initiative meeting. On June 29, a smaller group interrupted the MLPAI’s Science Advisory Team meeting in Eureka. Members of the Coastal Justice Coalition pointed out that there is no scientific data that says tribal gathering has any negative impact on the coastal ecosystem and the Act does nothing to stop pollution and off-shore drilling — the real threats to the ocean’s productivity. The Coastal Justice Coalition is a group of concerned tribal citizens and community members who came together to make sure indigenous peoples’ right to gather on the coast is respected.